In the 19th century, the Port of New York was the primary port of entry for goods reaching the United States, and as such the Custom House in New York was the most important in the country. In 1853, for instance, it collected almost 75% of the custom revenue in the country. The building is on the National Register of Historic Places, and for both exterior and public interior spaces. The Custom House was one of the first sites protected by the New York City Landmarks Preservation Commission. Constructed between 1902 and 1907, the building is considered to be a masterpiece of the Beaux-Arts style, where public transactions were conducted under a noble Roman dome. It incorporates Beaux Arts and City Beautiful movement planning principles, combining architecture, engineering, and fine arts. Lavish sculptures, paintings, and decorations by well-known artists of the time, such as Daniel Chester French, Louis St. Gaudens and Albert Jaegers, embellish the facade. The Location: The building sits on the site of Fort Amsterdam, the fortification constructed by the Dutch West India Company to defend their operations in the Hudson Valley. The fort became the nucleus of the New Amsterdam settlement, and in turn, of New York City. From 1799 to 1815, the first Custom House at this site was the Government House. When: Starting time is 10 AM. Sleeping late? Don't worry, come anyway, we'll be there. How: An easy train ride from Whitehall stop on the N or R train, or the Bowling Green Stop on the 4 or 5 train. Lunch: 12:15 - We'll have lunch al fresco to enjoy the good weather. Bring your own or rely and the numerous street vendors. We will probably have lunch in Bowling Green Park which faces the Customs House. If it's too crowded there we'll walk a block closer to the river to enjoy the wider spaces at Battery Park. Lots to Sketch at Stone St. Afternoon: 1:15 Back to sketching the urban scene. 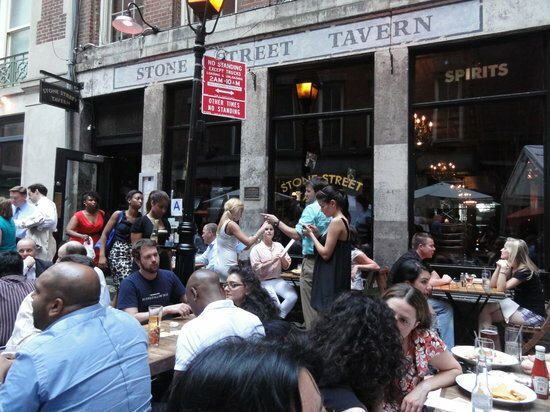 Show and Tell: At 3:15 we'll meet by the front entrance to Bowling Green Park, closest to the Stone Street to share drawings, good stories and a beer or wine if you're so inclined, lite eating and full meals also available.